"Soft", fine, rounded sand... vs. larger, sharper-angled gravel. Some can tolerate some salt, most really don't like it. Hello Team, I searched the archives and I can't find this one. I was hoping for some help with Corys in my tank. I have had a 15-gallon column tank for two years, with a single Opaline Gourami, five cherry barbs for a year (three m, 2 fem), and two (avg.) non-dwarf Corys. I feed flakes and float pellets once daily, a sinking shrimp pellet every few days, and freeze-dried bloodworms once a week. My ammonia and nitrite levels are zero and my temp hovers around 77 degrees. I filter with an AquaClear 20. I seem to only manage to get a 6-month lifespan from my corys, regardless of the breed. This seems short; when one passes, I buy a new pair to avoid loneliness, and the cycle continues. Just today, I have a single one again. (1) should I purchase a single or a pair more corys if any, and (2) am I doing something wrong or are corys simply a bad idea in this configuration? 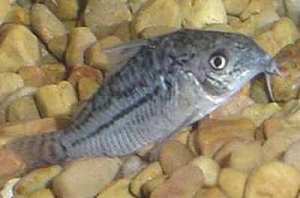 <Corydoras are basically sound fish, but they do have a couple weaknesses. need. This brings us to the second point, their need for air. If the tank is too deep, they can't easily swim to the top to gulp air, and this in turn leads to stress. I don't think a 15 gallon tank is likely to be too deep, but if there's something stopping them swimming, like a strong current or aggressive/nippy midwater fish, it might have an effect on them. I know they should be kept in larger groups but I don't want to crowd them on the small floor. Should I choose another scavenger instead? Bristlenose catfish seem too "dirty". Any insight would be greatly appreciated. Thank you for all you do! Great advice, thanks Neale. I think I might give the whiptail a shot, as you suggested. For this columnar tank setup, so you think I should go for one or two? Hello Crew, hope all is going well for you. I have a couple of questions, please. First, please tell me if Cory cats count against the total number of inches per gallon of water allowed without overstocking. Also, I am setting up a (36” x 15” x 13”) innovative marine 30 gallon tank and would like to know how many lumens of LED lighting I would need. I will have freshwater fish with no live plants. I would like something that will bring out the colors of the fish and illuminate the whole tank without being too bright. Thank you for the help. I have one more question please. I am considering what type of substrate to use and I have heard that aquasoil is very good. I have used both sand and gravel before; but with sand I tend to vacuum up some of it when trying to clean. Is aquasoil OK for freshwater aquarium with fish only? Does it raise or lower pH, and does it get compacted where it can form dead spots? Thank you again Neale, Sorry for another question, but could you tell me a substrate you would recommend other than sand that tends to be easier to clean (if there is such a thing) and less likely to form gas pockets? <Gas pockets in sand is a bit of a myth, so I wouldn't get hung up over it. Think about it for a moment. Marine aquaria contain fish infinitely more sensitive to poisonous gases than freshwater fish. But what substrate do they use? Yep, sand. Ah, you say, but they have worms and snails and shrimps cleaning the sand. Yes they do, but so does the freshwater hobby, in the form of burrowing snails (Clea helena and Tylomelania snails or Lumbriculus worms if you don't fancy Melanoides spp.) and plant roots (which carry oxygen down into the substrate). Indeed, sand is beneficial in freshwater tanks precisely because anaerobic decay reduces nitrate levels, though this effect requires a 'deep sand bed' rather than an inch or so. and are there any easy to keep shrimp I can put in a fish only freshwater tank? Hello again, I wanted to ask if I use a small layer of sand (1-11/2 inches) and have no critters to stir up the sand is there still a good chance of having no gas pockets? Thank you again. My name is Gabby and I'm new to aquariums (had one since August) and loving it. I've slowly built a community tank (doing lots of research) since then and it's gone quite well. First of all, big fan of the site. 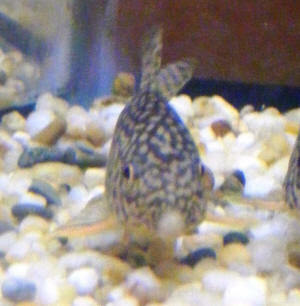 We have an established (4 years or so) 10 gallon tank occupied by just 3 Corydoras sterbai. I have a couple goals for our setup: (1) Encourage barbel regrowth for our oldest member (2) reinvigorate our flora so I could possibly start a shrimp tank and move the sterbai over to a new 20G long setup once we get some long term stability. flourishing but for some reason our tank health tapered off. As far as water conditions, let's see... water temp around 82F, we use water conditioner, and we are doing (irregular to be honest) 25% water changes every 2 weeks. I'm going to get chastised for this but I'm not huge fan of these water tests so I can't provide nitrate numbers (they're a lot of work shaking and waiting and such.) Our hardiest sterbai has survived all 4 years but has lost her barbels. She is very active in the tank but even with weekly water changes haven't seen new barbels growing in. We tried a couple things starting with upgrading our filter to a Marineland Penguin BioWheel <https://www.petco.com/Shop/Product.aspx?SKU=989738> instead of the stock filter. Her newest companions (purchased 3 months ago) still have their long healthy barbels so the I'm assuming the water quality must be acceptable. What can we do to improve the quality of life for our fish? at the suggestion of our LFS. Do you have any suggestions on what we can do to encourage more plant growth in our tank? Thanks. Of course, I have a couple more questions. We discussed how Marble Veil Angel's fins are never perfect, due to their immune system and the normal bacteria found in their tank water. Well, I have to accept this, even though I find it horrible. However, even so, is there anything I can use in the water to help the fins? I do a 30% water change every week, sometimes I notice the small roundish spots of fungus that eat the fin, then disappear. There is only a very small amount of fin gone, and looking at pictures of marbles, my fish seems to be doing better then most. Oh, great news. I called the company on the Aqua Terra was informed that the acrylic is good for life, and won't come off or harm the fish. I researched more on the Estes and, as told by the person whom sold it to me, it is inert, and from reading, a lot of people prefer to use it, as it does not raise PH and is very nice and fine. I also am gonna get some Caribsea sunset sand, I love the color and read on WetWeb, that it is safe for soft belly fish. I have had tank running for about three weeks now, using ammonia to cycle. My ammonia level is at 0, but my Nitrites are still at about .50. I am so glad I can put plants in now, cause of course, I am like a little kid, and cant wait to put them in. As a paranoid mommy, I am afraid to harm the fish, but I trust your knowledge, and will probably put those little Corys in! I will send you a picture of both tanks when I get them situated. You and WetWeb deserve a lot of credit for keeping me in the fish hobby, so I would love to share my tank photos with you!!! If you put in search area and hit search it takes you right to it....enjoy!!!! "Right now I have regular aquarium gravel in my tank. Is there any special type of gravel/sand I should use to prevent the Corys from getting injured and that is also good for the plants? Is laterite a good option? Before recommending people swap one type of sand for another, it's a good idea to have them look over the Carib Sea web site. It rates sands depending on two key things, whether they're safe with soft bellied fish (like catfish) or burrowing fish (like gobies). Tahitian Moon Sand for example gets a "no" on both counts. The problem is that sands made from the glass production industry (like Tahitian Moon Sand) is too abrasive, and scratches the mouths, whiskers and bellies of fish like catfish. I'm not sure about laterite. The real stuff is mud rather than sand. I've only used real laterite as a supplement to pea gravel underneath a layer of smooth silica sand, the two separated by a gravel tidy. I can't really see why anyone would want a substrate made entirely from laterite mud; it's so darn expensive, and makes a real mess! But the laterite-enriched "complete" substrates are something else, and I don't know if they're made using glass or not. Thanks for the information. I have read that folks have had success in using Tahitian Moon with soft-bellied fish, including rays, so is why I mentioned that I was considering changing my own substrate to the Tahitian Moon. Now, I'll reconsider, and it's good to know that even CaribSea doesn't recommend its use in tanks with those type of fish. I was not aware of the page you linked me to, and will look it over prior to suggesting sand or re-aquascaping my own tank! As for the laterite, everything I found on WWM in my research to respond to the query did indicate it would be safe, but I did see in the process of reading that most folks don't use it as their sole substrate. However, I figured this individual may not be planning that, either, but wanted to know whether the laterite itself would be harmful. It's good to know that it's not, especially considering that this isn't a product I'm familiar with. However, as I indicated with the "play" sand, it can be difficult to go on the name of a product in determining its safety -- for example, by laterite, was the querier referring to plain laterite, or these mixes you're referring to? I honestly don't know. I assumed plain, because nothing else was indicated, and based my response on that. Overall, I think as long as the querier takes care to avoid sharp substrate and moves toward soft, smooth sand, he or she should be okay, and I indicated that this was the reasoning behind my approval of the laterite. Thanks again for taking the time to respond to my query-within-a-query! I had helped this person thus far, and wanted to continue helping, but since I was in unfamiliar territory with the laterite, with nothing to go on but what I found on WWM, definitely wanted to be sure I was providing accurate information. I don't know either, Melinda. This might be one of those times where you recommend "consulting with the manufacturer" rather than risking your own reputation. For what it's worth, you're probably right, but I've never used a laterite-enriched synthetic substrate, so can't speak with any authority at all. I have a 20 gallon aquarium with pebbles at the bottom and many artificial and 3 real plants. The aquarium is cycling right now and I am following the technique you outlined of getting used substrate from the petstore and leaving it in for ~ 3 weeks while checking. 1. What parameters should I check in order to know whether the cycling is complete? clean. Is it ok and sufficient to add two julii Corys to this system? We have decided to go with 8 Neon Tetras and 6 Corys. Right now I have regular aquarium gravel in my tank. Is there any special type of gravel/sand I should use to prevent the Corys from getting injured and that is also good for the plants? Is laterite a good option? I have a 10 gallon tank with two peppered Corydoras in it - they were given to me by a friend who was breaking down her tank. I have heard they like to be kept in groups - how large of a group can I keep in a 10 gallon tank, and what types of live plants should I plant it with? I have pool filter sand as a substrate. <A ten-gallon tank is on the small size for this species, so in the long term, you want to think seriously about something around the 20 gallon mark. Smaller tanks are difficult to keep clean, don't tend to be stable, and don't provide enough space for fish this size to swim about and exercise themselves. Since the price differential between 10 and 20 gallon tanks is trivial, there's no reason to buy these smaller tanks that I can think of. They take up about the same amount of space, surprisingly enough. Receive a best greeting. Two months ago try to start in hobby cycling a 10 Gallon tanks as recommended. <You do realise 10 gallon tanks can only hold a limited variety of fish? I acquire in a local pet store 5 nice Bicolor Corydoras. Misfortunately after a week they begin to die. For now just one survives and this one looks good and healthy. My concern right now is...put other companion to my lone Cory. The problem is Bicolor Cory cats is not common in the area and I cant find other ones. Can I put other types of Corydoras with him for example schwartzi or even pandas?....any other recommendation? Hi, I wrote in a few days ago about a sick fish and Neale told me that my tank is simply too small (3 gallons- 1 molly, 2 platies, 1 albino Cory). Since them I have found a home for them and have been doing research on what kind of fish I could put in such a small tank. My research has come up with a beta. However, my concern is that these other fish which have been in my tank since January have been sickly or the water has been off and so there has been lots of Melafix in that tank (the antibiotic I have been using which apparently is just as good as antiseptic). I've had what may or may not be fin rot, something that may be parasites or dropsy right now (swollen belly, white stringy poo_, I'm not really sure and probably much more disease in the tank than I would like to know about. So my questions are: is this tank truly suitable for a beta? I went through a lot of trouble with these other fish, I want a fish that I can enjoy. It's 3 gallons, filter, BioWheel, heater, and lots of hiding spaces. Secondly, should I clean the tank before I put the beta in? If so, with what? Throw the gravel out? Just throw out the water and rinse the gravel to get rid of the old poo that might be buried under there? And for how long should I let the tank cycle, if at all? I know it seems like I can just look these answers up and I have but there has been a lot of conflicting information and some suggestion that I clean my tank with BLEACH! My BioWheel has NOTHING on it, looks just as new as it did when I got it back in January (4 months ago). Could it be from all the Melafix? And is there ANY WAY I can keep my albino Cory? I really like him and would be saddest to see him go. In your last response to me you said something about using sand as a substrate for my aquarium, because the Corys love it and stuff. But I've read numerous places that sand is a pain to clean and you have to kind of move it around frequently. cleaning" if you don't have time to do a water change. No, you don't need to stir the sand all the time. Your Corydoras will take care of that! Instead of using sand, though, I read that quartz sand is a really good choice. Two days ago I discovered that two of my five Sterbai Corydoras had lost their barbells and both have a white lump on the tip of their nose. The lump appears to be solid, see attached pictures. I've removed them from the community tank and put them into my 25L holding tank. As per the LFS (here in Australia) I have begun treatment with Tri-Sulfa tablets. I've also added an airstone to the tank, in case they need extra oxygen. The other Corys and community fish appear to be fine. Tank has been established for 11 months. Does anyone on the Crew know what this is, and have I begun the right treatment? Thank you in advance for any advice on this matter. <Deanna, the treatment is very simple. Take out the gravel; put in smooth (not sharp!) silica sand or an aquarium sand expressly suitable for burrowing fish (many aren't, e.g., Tahitian Moon Sand). Thanks for your prompt response Neale. The choice of substrate did cross my mind, and I will change over ASAP. Should I continue with the Triple Sulfa treatment in the quarantine tank because they still have a lump on their nose, or can I move them back to the main tank?